Winners of Toku Toy Box Revealed! Just over 1 month ago TokuNation began the countdown to today, January 5th 2014, which marks our official 3 year anniversary! Over the course of December & the first week of January we posted over 20 image galleries of various toys running the entire spectrum of tokusatsu. The goal? To give our users the chance to discuss these incredible toys. The result of these discussions? Every time a post was made in these threads, the users making them automatically had their names put into a random drawing for 1 of 4 MASSIVE Prize Packs for our annual Toku Toy Box Giveaway! With 21 galleries, 66,000 page views, over 1700 posts, and a slew of new users joining the fray, we’re at long last ready to reveal the 4 winners of our prize packs! Check out the video below to see who the lucky winners are! CONGRATULATIONS to our 4 winners and thanks once again for another incredibly successful year here at TokuNation.com! We can’t wait to do this again! As Bandai of Japan & Banpresto hold their annual summer toy festival we’re seeing a lot of what we’ve seen before in terms of our favorite Japanese heroes. However a few new items have snuck out and onto display that we haven’t quite seen yet. In some cases we’ve got better shots of a few things we’ve only glimpsed til now. On display at the moment are the various minipla from Ressha Sentai ToQger including the upcoming Safari Ga Oh as well as several other combinations like Cho Cho ToQ Dai Oh. But of special note is the upcoming Rainbow Clear SP set of ToQ Oh & Diesel Oh! This set was initially revealed via an imageless Amiami pre-order but now we can see them in their wonderful translucent glory. While we’re on ToQger some new vinyls have also been unveiled which will definitely please fans of the series. Joining the likes of General Schwartz & the Kuros is Baron Nero of the Shadow Line! On top of that we have some ToQ Changed versions of ToQ 1 in Pink & Yellow! Topping things off for Kamen Rider Gaim is the previously revealed DX Yomi Lock Seed & Arms Change Ryugen Yomotsu Heguri Arms which are also on display here. Finally have some better close up shots of the pair. And the placard next to Ryugen apparently confirms that he will indeed come with the Overlord’s weapons! And not to be left out Banpresto has some more Dual Solid Hero Kamen Rider figures on display as well! 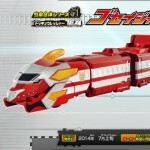 Ressha Sentai ToQGer DX Build DaiOh Video Review Online! The massive DX Build Ressha/Build Dai Oh set has finally been released! 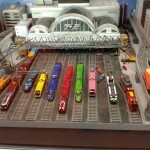 And Youtube reviewer wotakufighter has put up a review of this exciting new entry on the Rainbow Line! Build Dai Oh should be heading to online retailers this weekend so check your e-mails for payment requests! Fans who preordered Build DaiOh should keep a close eye on their mailboxes, the Orange Ressha should be on track to you very soon! UPDATE! WotakuFighter has put up a second video featuring the ToQGer’s Super-Duper Combo, ChoCho ToQ Dai Oh! Rounding out the number of giant robos and trains for Ressha Sentai ToQger, we have our very first look at the Hyper Ressha Tei Oh! 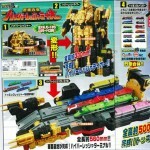 This behemoth train is decked out in black with gold chrome, this giant can become either a Ressha on it’s own, it’s own robot, or become a mobile carrier for ToQ Oh called Hyper Ressha Terminal! Although Hyper is part of it’s name it doesn’t appear this mecha in any way accommodates the actual DX Hyper Ressha. But it doesn’t end there! This new ressha can assume a combined robot mode that uses the forward section of all the main line resshas, ToQ Rainbow! We only have this single image to go off of for now, but for the time at least it doesn’t appears there’s anywhere for the second half of each Ressha to go. But this is definitely an imposing combination that’s sure to divide fans with it’s design. Time for a double dose of legendary train hero power-ups from Ressha Sentai ToQger! And it’s also time for TokuNation to test drive it’s newest segment, Toy Tuesdays! Each week on Tuesdays (most of them anyway) we plan to bring you a new toy gallery. This week it just so happens to be a pair of new figures but we’re going to be digging into a back log of rare & vintage toys as well as this segment progresses. So stay tuned! The recently released DX Kyoryuger & Den-Liner Resshas are featured in the Heisei Rider Vs. Show Raider: Kamen Rider Taisen Featuring Super Sentai film. But each are of course based on heroes of the past! One from Zyuden Sentai Kyoryuger, the other from the first train themed hero series, Kamen Rider Den-O! Each is based on the central mecha of their respective series albeit in a miniaturized form. Combining Kyorguer Ressha with ToQ Oh results in ToQ Oh Kyoryuzin but when you add Den-Liner to the mix you get ToQ Oh Kyoryuzin featuring Den-Liner! Check out our 40 image gallery for this pair of new Resshas after the jump by clicking “Discuss on the TokuNation Forums” at the bottom of this post. Goseiger & Gokaiger Resshas follow in the footsteps of the Kyoryuger & Go-Busters Resshas, all of which can form new heads and chest pieces for the DX ToQ Oh, each one resembling the main mecha of their respective series. The Yuudou Breaker is the personal weapon of the soon to be seen ToQ 6 and will include his Drill Ressha! Check these new images out after the jump! Our site sponsor, BigBadToyStore.com, has sent out their latest newsletter alerting everyone of their new arrivals and their new pre-orders! Some of these items are guaranteed to be HOT, so don’t miss out on the opportunity to guarantee your pre-order! For reference – we linked the pre-orders for S.H. Figuarts Kamen Rider Gaim & Baron the last few updates. They were first release pre-orders and they were up for months. These pre-orders are now sold out. Just another reason to act now instead of “I’ll wait later…”. Either way, check out these new arrivals and new pre-orders! 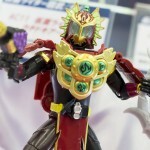 You won’t find better customer service on the net – so check out BigBadToyStore.com for all your tokusatsu needs!! Check out the full newsletter by clicking “Read More”! 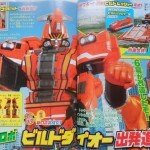 As speculated earlier in the series it seems ToQger will feature a new power up, Hyper Mode! Accessible through the Hyper Ressha, Hyper Mode gives the ToQger’s bright golden train armor for the chest and shoulders. Something very reminiscent of the Super Goseigers. Though for now this power up is confirmed only to be used by ToQ 1 it’s entirely possible that the other members may have access to it as well! 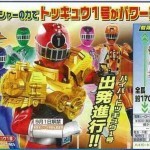 These magazine scan also show us our first image of Hyper Mode in toy form with the ToQ 1 Hyper Mode vinyl. We get a great look a the DX Daikaiten Cannon which includes the Hyper Ressha. And we get looks at the very first Shadow Line vinyls! General Schwarz and the Kuros! It’s time once again to use your imaginations and view our latest gallery from Ressha Sentai ToQger! Today we’re having a look at the first EX/Legend Sentai Ressah released in the toyline, DX Go-Busters Ressha! Go-Busters Ressha of course borrows it’s likeness from the Go-Busters Ace of Tokuemei Sentai Go-Busters. It’s Ressha form is styled after the Ace’s cheetah mode whereas it’s head when combined with ToQ Oh is clearly an approximation of the Go-Buster Ace’s robot mode. When combined with ToQ Oh, ToQ Oh Go-Buster Ace is formed. Of course since this figure features all the same connectors as the rest of the line you can combine it in as many different ways as you choose. This combination may or may not be in a film or TV episode. Currently it’s actual physical appearance outside of toy form is unconfirmed. Click “Discuss on the TokuNation Forums” at the bottom of this post to be taken to the full 40 image gallery of DX Go-Busters Ressha.